Dansby Swanson is still technically a prospect and 2017 will officially be his “rookie” season, but I have not included him on my list. Yes, I do think he is the best shortstop in the Braves organization, but my goal with these lists is to provide the top names for Braves fans to look out for in the minors. Swanson will clearly be opening the season as the Major League club’s starting shortstop, so, staying true to the goal of these lists, you will only be reading about the Braves top players set to start the season in the Minors. While Swanson is the number one prospect in the system, he has three guys behind him that are also cracking many people’s organizational top 30. Though the shortstop position has been locked up for the foreseeable future, many experts believe that several Braves middle infield prospects will ultimately make the move to other positions or serve as utility guys as they move up the system. For now, there is plenty of time for these prospects to develop and not worry about that position switch for awhile, especially with Johan Camargo manning the middle so well this Spring behind the trio of Swanson, Brandon Phillips, and Ozzie Albies. The Braves forked over $4.25 million last Summer to sign the then 16 year old Venezuelan shortstop. He was by far the most talked about international prospect in last year’s class and is set to make his pro debut in 2017. Maitan is a switch-hitter who is praised most for his power from both sides of the plate. He has a very effortless swing and in the few clips I found of him at the plate, the ball jumps off of his bat. The reality is, Maitan is much more than just a switch-hitting power bat. Every tool he has is already above average. He runs the bases well and has good range in the field. His plus arm also gives him the ability to play several positions defensively. The rumblings have been that Maitan’s skills will translate best at third base in the Majors. With the rest of the infield seemingly set for years to come, this is music to the ears of Braves fans. With that being said, he just turned 17 less than a month ago and has yet to play in a pro game, but all signs point to Maitan developing quickly. Seymour came to the Braves organization from Miami in a trade late last season. Born in Nassau, Bahamas, Seymour was taken in the seventh round of the 2014 draft out of American Heritage HS in Delray Beach, FL. 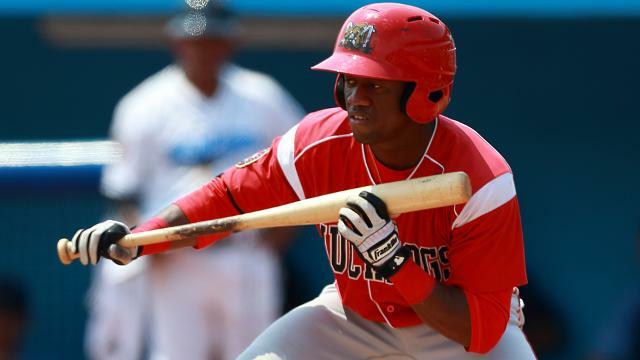 He is regarded as the fastest player in the Braves organization and has been rated with perfect 80 speed by mlb.com. Outside of that, the offensive tools still need to continue developing. Although there is very little power potential for the 5’ 11” 165 lb shortstop, scouts believe he has the ability to be a league average contact hitter as he continues to develop. It is worth noting that Seymour is a converted outfielder and has a very good arm and range in the field. The 21 year old only spent 21 games in the Braves organization last season but did spend the entire year in the South Atlantic League. Seymour had some trouble getting on base last season, but when he did he was almost guaranteed to wreak havoc. His 43 stolen bases were tied for second in the league last year. There is no doubt that it will be fun watching Seymour take over the basepaths in 2017, but Braves fans should keep an eye on his development at the plate as he keeps working towards becoming a true lead off hitter. Another teenage top prospect and another big July 2 signing, the Braves paid the then 16 year old $2 million to sign as an international free agent in 2015. A product of Puerto Plata, DR, Cruz not only skipped the DSL and went straight to the GCL in his first pro season, he earned a promotion to the Appy League, just 26 games into his age 17 season. It was really a tale of two halves for Cruz as he slashed .309/.336/.405 in the GCL and .183/.204/.279 after his promotion to Danville. He may have been moved along just a little too quickly last season and I don’t expect those struggles to continue in 2017. He is an excellent runner with highly rated speed, 70 according to mlb.com, and has the potential to be above average in the field and making contact at the plate. An intriguing note on Cruz is that, while he is listed a switch-hitter, he is considered to be much better from the right side of the plate as opposed to the left. Adjusting to pro pitching is already challenging enough, but when you add in trying to learn how to hit from the opposite side of the plate, the numbers are more than likely going to leave you looking for more. It will be interesting to see how Cruz developed from the left side during the offseason and see if his numbers bounce back. ← Previous Story Cards’ Pitcher Ryan Sherriff: Where Will The Car Take Him?